Use our BTU calculator before you make a firm decision about your designer radiators. Make sure they will satisfy the heat requirements of the room they are intended for. Selecting a radiator with insufficient heat output means that the room never reaches its optimum temperature, leaving you with a cold and uninviting space. Choosing a radiator with too high a heat output could result in having to pay more in heating bills than necessary. Calculating the correct BTU output for your room is essential to help you make an informed decision for the radiators in your home. Of course, it is also possible to combine several radiators to achieve the required BTU level. 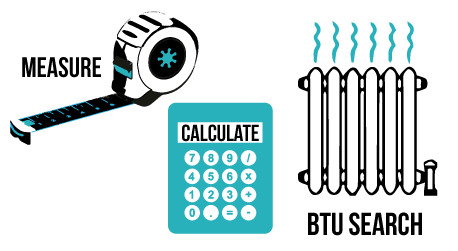 Use our BTU Calculator below to help you determine the BTU output your chosen radiator should provide. Just enter some basic details into the fields and press CALCULATE. A BTU (British Thermal Unit) is a traditional unit of heat; it is defined as the amount of heat required to raise the temperature of one pound of water by one degree Fahrenheit and is roughly equivalent to 1055 Joules. How do we calculate your room’s heat requirement? Your room’s BTU requirement is based on the cubic volume of the space – the length, width and height of the room – as well as what is around it, and the existing level of insulation. Using this information, we can then calculate the expected heat loss for the room and provide an accurate BTU output needed to heat the space efficiently, so that the room is kept comfortably warm but at the lowest possible fuel costs to you.